Home » Blog » Top 10 tips on how to organise a successful Award Dinner! We’re not all James Corden at the Brits with an engaging wit and an innate ability to keep our audiences enthralled with our witty banter. 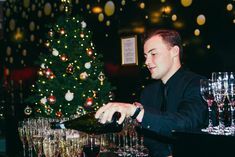 However, here at Merlin Events, we do make every effort to guide clients through a few rules of presenting award dinners we think you might like. Make it short, sharp and to the point and get your message across as clear as possible. 1/ Have the starter already plated as this will save you time. It goes like this – starter then present three awards, clear away the starter, present three awards. Serve the main course and present three awards, serve dessert and clear. Get the catering staff finished as soon as possible so you can get to coffee and let the awards be complete, remember staff staying late cost more money. 2/ How many awards are there? If you think the whole thing is going to take about 40 minutes then cut it down. You want to celebrate success not bore people to death with the night of a thousand awards. 3/ If the CEO is presenting is he/she a natural speaker? Some are not. If possible try to get feedback from the entire team. 4/ A VIP presenter can make all the difference, and even better if he/she has a connection to your industry, having said that, it can be very expensive. As an alternative perhaps there’s someone in your organisation that has a gift for presenting? One way of finding out is to perhaps hold a competition to find a host. You’d be amazed at the talent you may be able to unearth. 5/ Choose a menu that’s simple with a fun twist. Try and include pre event canapés, they’ll keep hunger at bay until the main event. 6/ Music to accompany the winners as they collect their awards. Try and be creative, perhaps you could match the music to the winner. Perhaps you could add a few strobes, scanners, confetti cannons etc. Has the winner done something that merits highlighting, making the “moment” matter? Madame Tussauds has a great light rig and stage which is ideal for award dinners. 7/ If you’re going to be using technicians to make your special moment for winners, then make sure you use companies that have been recommended to you. Haydn at Dragon is good and we’ve used him here at Merlin Events many times. He comes highly recommended, having worked with him for the past 14 years. He really does take the stress out of an event. 8/ Be organised. Awards should always be placed on a table in order of presentation, ideally with signage near each award indicating which award and who it’s being presented to. There’s nothing worse than giving out the wrong award or presenters fumbling around for the correct award. 9/ Try and source a venue that has some or all of the equipment included. It will make your life a lot easier. Madame Tussauds is a great venue for an award dinner for up to 380 guests. 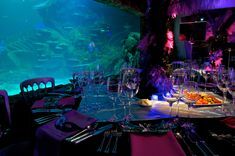 The Sea Life London Aquarium is perfect for a more intimate awards dinner for up to 180. 10/ Is your award dinner going to be themed? It really depends on your “brand” and the overall communication of the awards. Selecting a fun or different venue is far better than trying to theme a hotel suite.